The Seven Wonders of the World, also known as the Seven Wonders of the Ancient World, is a collection of extraordinary constructions referred to numerous times in ancient Hellenic media. The first such lists occurred in the first and second centuries BC, with many thanks to the 4th century BC conquests by the Greeks. These conquests allowed access to the civilizations of the Egyptians, Persians, and Babylonians, of which Hellenic tourists frequently mentioned in their own writings, be it poems, or even guidebooks. 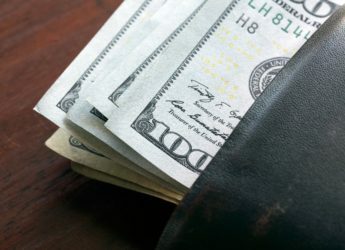 The first Wonder on this list is also the first created. Archaeologists believe the Great Pyramid to have been completed near 2560 BC, taking ten to twenty years to construct. As the oldest, the Great Pyramid is surprisingly the only one to remain intact. It’s also the oldest, and largest, of the three pyramids near El Giza, Egypt. Archaeologists believe the Pyramid to be a tomb commissioned by the Egyptian Pharaoh, Khufu, thus granting it the alias of Pyramid of Khufu. In its prime, the Great Pyramid of Giza held the title of the tallest man-made structure in the world; the Pyramid retained this title for nearly four-thousand years. Detailed as an extraordinary feat of engineering, the gardens were described as a massive green mountain comprised of mud bricks. The Hanging Gardens were a series of tiered gardens rising to the heavens, consisting of a vast variety of trees, shrubs, and vines. 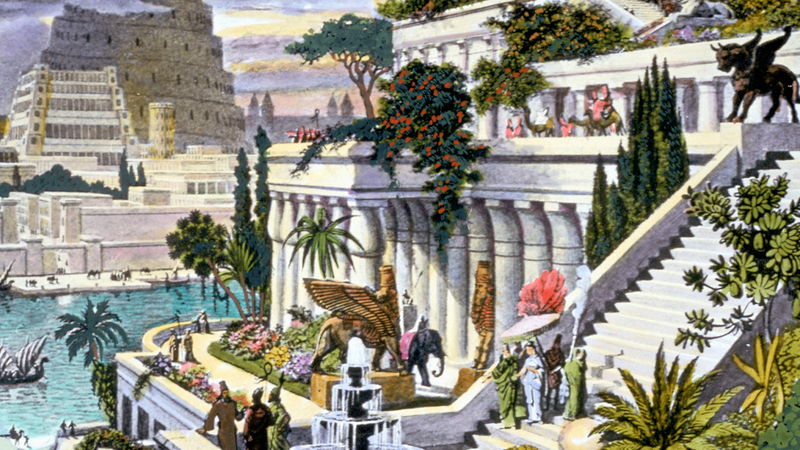 The Hanging Gardens of Babylon is the only Wonder without a definitive location. In 290 BC, a Babylonian priest by the name of Berossus, credited Neo-Babylonian King Nebuchadnezzar II with the creation of the Gardens in between 605 and 562 BC. The priest cited their location in the ancient city of Babylon, within proximity to current-day Hillah, in the Babil province of Iraq. However, there exists no further documentation, or archaeological evidence in Babylon, to suggest the Gardens even existed. Current speculation suggests that the Hanging Gardens were either destroyed after the first century AD, or they were purely mythical, instead symbolizing a fantasized garden. Once located in Ephesus, near Selçuk in modern-day Turkey, the Temple of Artemis seems to have possessed the resurrective powers of a phoenix. The Temple of Artemis was rebuilt from the ashes on three separate occasions only to be destroyed a fourth, and final time. The initial structure is believed to have been created in the Bronze Age, surprisingly accredited to the Amazons, before being demolished by a flood in the 7th century BC. In 550 BC, the Temple’s ten-year reconstruction was overseen by a Cretan duo: Chersiphron, an architect; and, his son Metagenes. Two centuries later, in 356 BC, an act of arson consumed the rebuilt Temple, burning through the wooden roof-beams. The final construction occurred only thirty years later, in 323 BC, funded entirely by the local Ephesian population. This third structure would become the Wonder we consider it now, surviving for 600 years. Unfortunately, in the year 268 AD, the Temple was destroyed by the Goths. Bonus fact: A few of the Hagia Sophia columns initially belonged to the Temple of Artemis. Circa 435 BC, the renowned Greek sculptor Phidias erected the Statue of Zeus in the residing Temple of Zeus at Olympia, Greece. Phidias was employed by the Eleans for his construction of the massive Athena Parthenos statue, hoped Phidias’s work would allow them to outdo their Athenian rivals. The Statue of Zeus consisted of ivory plates, and gold panels over a wooden framework, representing the god Zeus resting on a magnificent throne of cedar, and decorated with ebony, ivory, gold, and various precious stones. Unfortunately, the Statue was destroyed during the 5th century AD, with no replicate being discovered. The only remaining details of its form exist within ancient Greek descriptions, and depictions on coins. Between 353 and 350 BC, a tomb was built in Halicarnassus (present-day Bodrum, Turkey), dedicated to Mausolus, a satrap (a governor in the Persian Empire); and, Artemisia II of Caria, his sister-wife. In honour of this, the burial site was named the Tomb of Mausolus. However, especially when discussing the Wonders of the Ancient World, the tomb is most commonly referred to as the Mausoleum at Halicarnassus. The Greek architects, Satyros, and Pythius of Priene, are credited for the Mausoleum’s design, which stood 148 feet (45 metres) in height, and consisted of four sides. Each side was decorated with an individually-sculpted relief attributed to these four Greek sculptors: Bryaxis, Leochares, Timotheus, and Scopas of Paros. Sadly, the Mausoleum at Halicarnassus was reduced to ruins by multiple earthquakes occurring between the 12th and 15th centuries. Bonus fact: Due to this Wonder’s fame, the word ‘mausoleum’ is now commonly used to described an above-ground tomb. Following a trend, the sixth Wonder is none other than the Colossus of Rhodes, and located in – you guessed it – Rhodes, Greece. 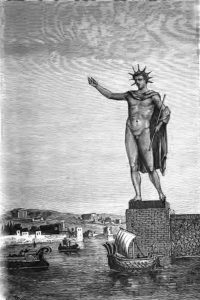 Standing, quite literally, at the height of 108 feet (33 metres), or approximately the same height as the Statue of Liberty, the Colossus was erected in 280 BC by Chares of Lindos to celebrate Rhodes’ victory over Cyprus ruler, Antigonus I Monophthalmus. Monophthalmus’ son attempted to invade Rhodes in 305 BC but was ultimately failed. As with the Mausoleum, this Wonder crumbled during an earthquake in 226 BC and was never rebuilt. However, as of 2015, tentative plans exist to build a new Colossus at Rhodes Harbour. The final Wonder on this list is the Lighthouse of Alexandria, or Pharos of Alexandria, whose creation is attributed to the Ptolemaic Kingdom; specifically under the reign of Ptolemy I Soter. Soter ordered the construction in approximately 305 BC and was completed during the reign of his son, Ptolemy II Philadelphus, between 280 and 247 BC. The Lighthouse achieved an astounding height between 394 and 449 feet (120 and 137 metres), labeling it the tallest man-made structure in the world for many centuries. Sharing with the two prior Wonders, the Lighthouse suffered from three earthquakes occurring between 956 and 1323 AD. It remained an abandoned ruin until 1480 AD when the remaining stones became the foundation of the Citadel of Qaitbay. Remnants of the Lighthouse were found on the floor of Alexandria’s Eastern Harbour by French archaeologists in 1994, and the Egyptian Ministry of State of Antiquities has discussed plans to turn the submerged ruins into an underwater museum.